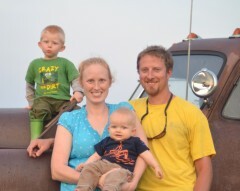 Matt Kautz and his family are the third generation to farm the land his Grandpa Milt started on in 1932. He lives on the farm with his wife and two sons while raising pastured livestock fulltime. 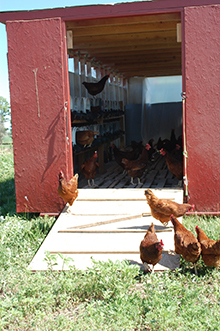 He produces eggs, poultry, pork, turkey and beef in harmony with animal welfare and sustainability. The livestock are rotated through pastures to mimic the patterns found in nature. All chickens and turkeys are process in a recently constructed USDA processing facility on the farm. This has minimized animal stress and maximized quality for concerned consumers. At Cottonwood Creek Farms everyone is welcome to stop by and visit, chat with the family, tour the farm, observe the animals, and even help collect eggs. We never use antibiotics, growth hormones, chemical wormers, animal byproducts, pesticides or herbicides. If we won’t eat them, why should you.